I really loved the show. The babies are sooo cute and you all are really great parents. I am impressed. I hope we get to see a lot more of you and your family! Great show and I like the honesty behind you and Casey. I hope you do very well and God will help you get through the rough patch. I watched your show and thought it was great! What a beautiful home and family!! I had twins when my oldest was 22 months. Life was busy, although not even close to what you are experiencing. I hope you are able to get a series out of TLC as many people are missing the Gosselin family story, and need a fresh outlook on reality tv, although I do hope that yours is a happy ending unlike the Gosselins. Please remember what is important and that is those precious babies and your oldest daughter. She needs lots of nurturing as well as the babies. Maybe an additional date night but bring her with you. I hope all works out for your family. Certainly enjoyed your show. Hope the financial issues can be worked out soon. You have a lovely family, and I hope TLC will let me enjoy your adventures every week. Take Care! Can’t wait to see more of the family on TLC!! great first show! Loved watching all the fun of the first year – brought back fun memories for me. I only had twins though – nothing compared to 5 at once. I look forward to seeing more episodes and reading your blog. Enjoy all the gooey kisses!! Remember… everyone will be watching every move you make and listening to every word you say! Use it for the glory of God! I love yall and will keep your family in my prayers! Just wondering, why didn’t they mention that you were doing your MBA? Loved it! I’ll be watching every episode. I loved the show! The honesty between you and your wife was so appreciated. Such a lovely family, certainly hope you are picked up as a full time show. Thanks so much for sharing. Wishing you all the best! My husband and I watched your show last night and we were so happy with all that you showed us. We also had to use DS (Donor Sperm) and we were so pleased that someone finally came out and said “I did that”. I just made us feel more “normal”. Anyway, loved the show and I’m telling everyone to watch it. You guys are amazingly strong and courageous. Congratulations and God Bless you. I totally agree with Ally on all her comments. The production companies want a show that sells and will edit in the way they see will bring in the viewers. I am sure you will remember where your blessing came from and will not allow any the production/editing to change that. I hope this is the best decision for your family and that people are kind to you,and not like how other reality families have been treated. I am a former Gosselin viewer who was flipping channels last night and found your program on TLC. I thoroughly enjoyed it. Thanks for sharing your story. Me & my daughter luv ur show!! Your babies are sooo precious!! Can’t wait to see them grow with their big older sis and their loving parents!! Amazing family – we really enjoyed the show and hope it becomes a series. I loved the show! Thanks so much for shareing your family, I really hope to see more of your family! Hello! I have followed your blog for a while now, but I’m not sure if I’ve ever commented. I watched your show on Discovery Health, and I thought it was SO cute! Great job! I nanny for quadruplets (who recently turned 2), so I have a small glimpse of what you go through every day! Love your show and your blog! Keep up the great work- your kids are beautiful! Congratulations on a wonderful show and to those amazing blessings including your beautiful daughter!! May God continue to bless your family, marriage, and life!! God has ways of working his way into our media and I’m glad to see another Christian family on TV!! Enjoy the journey this may bring and remember to stay grounded and continue to thank HIM for everything!! I look forward to seeing future shows!! but what i appreciated most about your show was the HONESTY. not every guy would be willing or man enough to do what you have done. and i have to say, casey looks SO GOOD–i can’t believe she had 5 babies at once! i will be praying continually for you and your wife, that your financial needs are met, that you remain strong as a couple, and that your children flourish. i don’t want to see another situation like jon and kate… that just breaks my heart. i know you all do the shows to support your families–i would do the same thing if i were in your shoes–but just be careful. again, i am praying for you! We enjoyed the show. I hope it works out as a series for your family. The babies and Eliot are all beautiful. I really liked that Ethan was so candid about his feelings on having children to begin with and how he has changed over time. Just don’t let “fame” change your attitudes and feelings for one another and you will be fine. God bless you all. LOVED the show, love how honest you were about $$, stress and just life in general. Praying you get a series and life contiunes to be good to you. Stunning house by the way and very cute, sweet kids. Can’t wait to see more of your family. I hope TLC picks you up. So I have been reading your blog from the very beginning and am so excited to see your story on TV the other night. I think it’s great for you to share you story and thank you for doing so. I was only able to watch half the show :( because I had to get up early but what I saw was really good. I wish you luck in the future but hope/ beg you not to turn into the Gosselins who won’t even give their loyal fans from the beginning the time of day because they are “Hollywood Stars” now. Anyway, lots of luck! I really loved your show. I am telling everyone about out. I think you both seem like a very warm loving couple and your kids are adorable. Keep it coming! I am watching your TLC show right now and feel like I have to write and give you my support! You are blessed and I wish your family health and happiness. I just watched your show today, 3/20 after taping it several days ago. I am also the Mom of multiples, although “only” twins and I also have two older children. I can totally relate to all the chaos and stress that was so honestly portrayed on your show, not to mention the financial difficulties of multiples. I loved the show and would definately watch again if you were to have an opportunity to do so. Like so many others have said though, keep your family first and remember what’s really important. Your children are absolutely beautiful!! Remember to have some “alone” time with your oldest daughther as well, as her world turned upside down with the birth of her 5 younger siblings. Good Luck. I just saw your show, and I just wanted to say that you look like an amazing family and that I hope everything works out for you, I’m sure it will, so keep faith. Good luck with everything in the future and take care. What wonderful people you are! I watched in awe tonight on TLC. 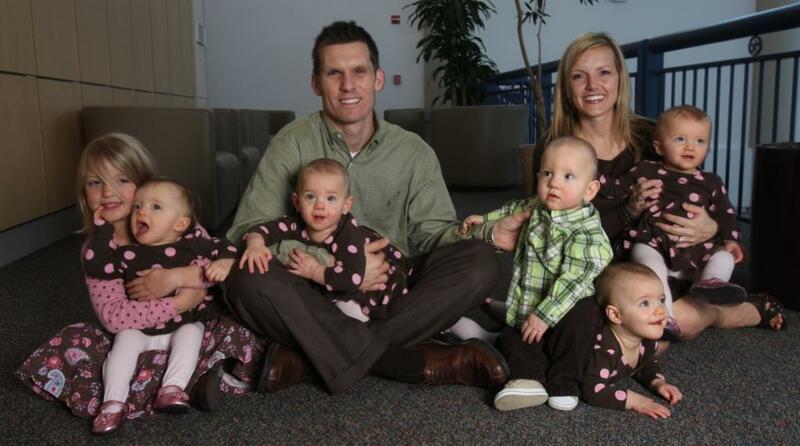 While I don’t have quintuplets, I have two small children and my husband in is law school. In a small way, I know what it is like to not know how to pay all the bills and get diapers. Is there some way I could send you some diapers? I’d love to help out. Keep it up you are fantastic! Your family’s story really touched me. God’s got a plan for you guys, trust in Him and all will work out. My husband and I were really impressed by your outlook and positive perspective you maintain through the hardships and surprises. No doubt you all have acquired some fans with your show. I’ll keep you guys in my prayers. btw..I was amazed by Ethan’s honesty and humility about using donor sperm. You two truly have a wonderful bond and are clearly great parents. Do you have a trust fund so that we can help your family out financially? I hope that everything goes really well for you, and you can get to stay in your beautiful home. God bless you for your wonderful witness to the world. Really enjoyed your show, please stay true to your God, each other and your family. You both seem too smart to let money or fame tear you up but guard your hearts always. Love those babies!!!! I just tuned into your show on TLC the other night and wanted to thank you all for your honest look at your lives-especially the fact that you all used donor sperm. My husband I used donor sperm to conceive our 2 year old son and it was the greatest decision of our life. Plan on keeping up with you guys and wish you all the best! I loved your TLC special! Will it be a TLC regular show? I hope so! Your family is so cute (and as with previous posts) I love that you are a Christian family—May God be glorified! Blessings to you all! What a sweet loving family. Enjoy your show…Eliot you are a great big sister. A joy to watch…. I just loved the show. It is a very loving family. It had me in stitches from the beginning to the very end. I hope you keep this on your station and I would rate this better than Jon & Kate Plus Eight.